I think the most challenging parts of this project were the ideation and conceptualisation phases. 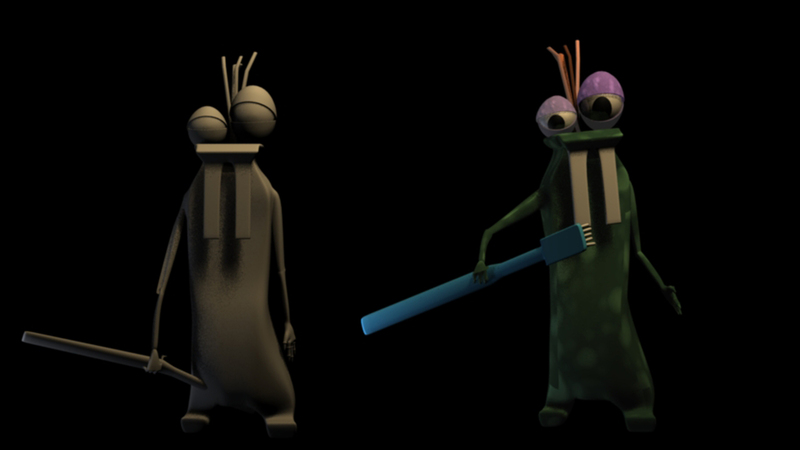 It was tough trying to design characters and settings that would support the comedy, look believable and be appealing. Looking back I think I spent a lot of time unwrapping UVs that then didn’t need to be used so perhaps I should have unwrapped for example one bottle/container and experimented on that one item. A lot of time was also spent re-unwrapping and re-texturing the second design of Snappy (also true for Blayne and Katie who had to re-rig and re-model) so perhaps we should have looked for more feedback at the design phase in order to avoid doubling the work. I was glad I took the chance to try out Mudbox even though I wasn’t sure it would work for me. I still think that the lighting and texturing could have been taken further – it’s missing a quality which I really like in works such as One More Beer!, No More Wine and Moments on the Cat Planet, but this may have also been due to the design and creating a believable fantasy world. Some simulation/dynamics may have added to the short also. For instance, I like how in One More Beer! the Viking interacts with the environment by knocking over a tankard of beer and also how he sends up a cloud of dust and shakes the table when he sits down to show his weight more. We also didn’t get to look into creating frothy tooth paste like we wanted. It was still fun and I enjoyed working with my team:) They made the hard work worthwhile. Blayne suggested that we should render the three layers – foreground, character and back wall of our scene separately. This saved hugely on the render time (especially because the background only needed to be rendered twice) and allowed for easier colour and contrast editing at the end. I rendered two different light set-ups for before and after Snappy turns on the light and then Blayne was able to tweak the background layer in Sony Vegas to make it look like sunlight coming through the back window. I tried some different versions of warm/cold between the foreground plus Snappy and the back wall in Photoshop for a quick visualisation of options. As usual, rendering resulted in a few problems. For one I had forgotten, while setting up the lighting, that you can preview the light in the viewport. Because of this, and despite doing a few spot renders with the animation in place, I missed a few problems e.g. Snappy’s head became too bright when he leaned too close to the light and his teeth fell into darkness for too long when he leaned backwards. One of his eye textures also failed to load. I also had to make sure that all the lights were linked correctly throughout the short e.g. the geometry of the toothbrush changed when it snapped and needed to be re-linked. Luckily these problems weren’t too difficult to fix. For the eye and teeth problem we were able to reload the texture/set up new lighting and cover everything, except what needed to be fixed, with a black surface shader. Blayne was then able to layer these new renders in Sony Vegas. For the lighting on the head, I just keyframed the position and shape of the area light so as to keep the intensity and spread of light even throughout and re-rendered the affected frames. I started to experiment with creating volumetric lighting in Maya but I found it difficult to get the look I wanted. At first I was using a spotlight and creating a light fog node but when I tried to shine it through a window shape the spotlight would shine through the geometry of the wall. I realise now that this was probably due to the samples being too low. I was also finding it hard to make the light rays appear through the window. This method uses volume primitives to add a container of fog within the scene. I liked that this method affects area lights as well as spot lights and I also liked how soft it can be. However, the fog rays were invisible from the angle I wanted to render at so I stopped experimenting at this point so as to work on other parts of the short. We wanted to create an atmosphere that would be suitable for a scary monster but not something too dark and grungy. I experimented with what I had read about the lighting in American Cinematographer about Penny Dreadful and how they were encouraged to push the black. I found it hard to get a balance between dark shadows and still getting a clear read of the scene. I also didn’t want the shadows to be too deep and without detail. I experimented a bit with using image based lighting to lighten the shadows as Alec suggested but didn’t spend enough time playing with this. Final Gather also helped to lighten the shadows but added a lot to the render time. For the wood texture I painted over a photograph of wood and then used my painted layer alone as a bump map. I tried roughing up the wood of the mirror with a painted bump map also but the team preferred the mirror being smooth. I hadn’t unwrapped UVs in a while so at least it was some practice. I also tweaked some of Blayne’s models to have more detail that would catch the light such as on the taps. I tried using my paint layer as a bump map which created more pleasing results and caught the light nicer. Katie and Blayne liked both so I also tried a version where some of the bump map was softly erased around the mouth. I experimented a little with how the eyes could look. I tried plain humanoid eyes and black eyes with an incandescent white center. Reptilian eyes may also have been an option but we liked the black/white ones enough to stick with them. Gerard unfortunately didn’t get the same texture treatment which was a lot due to time. Katie made a colour scheme that would stand out against Snappy. I then tried a simple dot texture by tweaking the Maya default textures. We were afraid it looked too much like camouflage/dappled light which would make Gerard more difficult to see so we kept him as plain colour solids in the end. We got further feedback from our classmates, the final years and Greg. The class consensus seemed to be that ore original idea was funnier than our proposed revised version of a monster with one tooth being the main character. Greg gave us further feedback about our monster designs for Snappy and Gerard. He said that in our later animatics we were loosing the contrast in shape between Snappy and Gerard, Snappy being broad and hulking while Gerard being small, tall and thin. Greg also suggested that Snappy’s horns were distracting and not needed for the story. I personally liked the graphic image of the horns against the backlight and thought as a design element they could be an icon of monster-ship but I also see how their absence of height emphasizes the hulking shape in Snappy’s new design. More teeth were also called for:D Blayne re-designed, re-modeled and re-rigged Snappy with the feedback in mind! :) My job was to re-light and re-texture. We talked to Mike for the first time quite far into our project. His reaction was that our gag wasn’t present. He said that comedy was usually about turning things on their head and that we hadn’t done that with our monster. He suggested that instead of a monster with many teeth that perhaps a monster spending time brushing one tooth for ages might be funnier. He also suggested that the build up of tension and the mood shift at the start might be time better spent elsewhere and to cut it out altogether – perhaps an establishing shot of somewhere with shared bathrooms and the door swinging shut might be more useful to the audience. This one starts with a monster trying to be discreet while entering a bathroom in a hotel/shared dorms. We see a poster behind the monster showing that she/he is someone famous as she shiftily slips into the door. It cuts to Ms. Monster standing in front of the bathroom mirror. She nervously looks around, then takes out her massive set of sharp monster teeth – they’re fake! She proceeds to quickly brush her teeth. The toilet flushes behind her, there’s someone there! She quickly scrambles to put her teeth in and it cuts to the little monster emerging from the cubicles. The little monster recognises that it’s a famous person and flashes lots of teeth in glee. Little Monster asks for a selfie. The last frame is a snapshot of the two with the famous monster grinning nervously and showing lopsided dentures. OR the famous monster tries to hide her secret by brushing furiously and filling her face with toothpaste foam. We were then told that it was too far into the project to make such radical changes so we ended up revising the current story that we had. 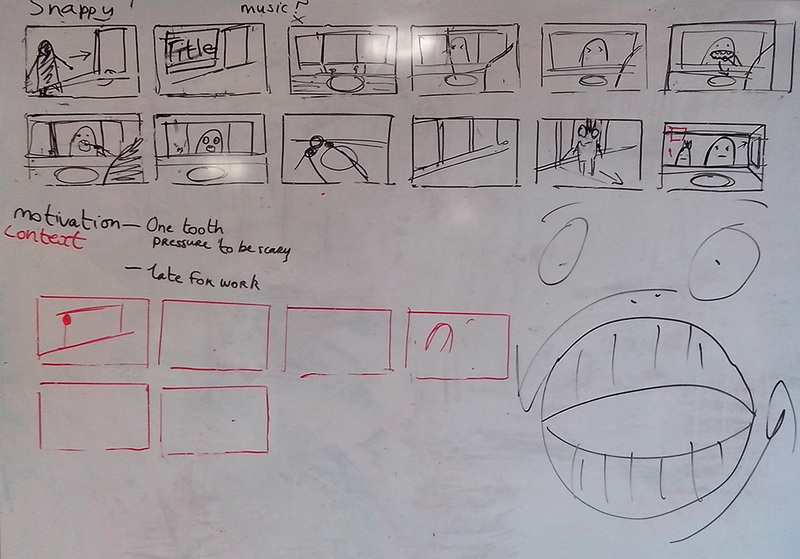 We reconsidered how we could add more jump cuts of Snappy in different poses and shifting between brushing and flossing to make the animation snappier (hence Snappy’s name, to remind us). Following on from the Digital Tutors tutorial I did about working between Mudbox and Maya (link), I experimented with sculpting scaly/reptilian/rough bumpy skin in Mudbox onto Blayne’s model of Snappy. I then exported the detail back to Maya through a displacement map. I had also mapped the UVs and used them to add painted detail in Photoshop. I had started to try combining my photoshop layers within the layered shader in Maya but this was starting to increase render time quite a bit. Both Katie and Blayne commented separately that it looked like Snappy had paint thrown at him – while I was aiming for a painterly look I didn’t want it to look this extreme. We had also decided together that the arms and horns would look cool if they were both bone or maybe ivory. I had problems with the displacement map at one stage which produced some funny results. Also, those colours should never have happened. 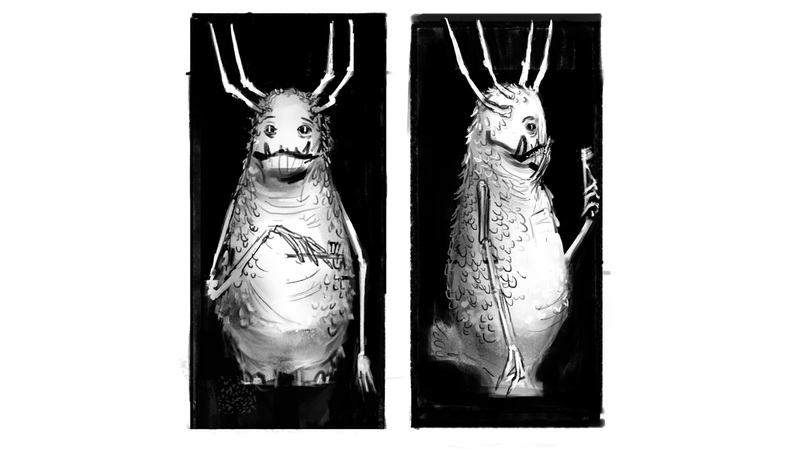 We hadn’t been able to see a creature in our sketchbooks that really fit what we wanted for quite a while. We came together again to discuss and sketch some ideas on the whiteboard for the design of our monsters, particularly our big monster, Snappy. We liked it most when we started to combine elements of Blayne’s character, Finn, with parts of the character from the animatic. I took these ideas and tried to give the concept from the whiteboard more form than a simple oval.